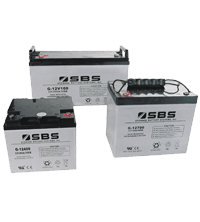 A gel battery ("gel cell") is a VRLA battery with a gelified electrolyte; the sulfuric acid is mixed with silica fume, which makes the resulting mass gel-like and immobile. 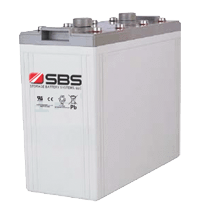 Unlike a flooded wet-cell lead-acid battery, these batteries do not need to be kept upright. 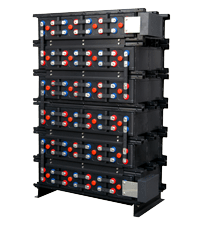 Gel batteries reduce the electrolyte evaporation, spillage (and subsequent corrosion issues) common to the wet-cell battery, and boast greater resistance to extreme temperatures,shock, and vibration. Chemically they are almost the same as wet (non-sealed) batteries except that the antimony in the lead plates is replaced by calcium, and gas recombination can take place. With gel electrolyte the separator was no longer such a critical, hard-to-make component, and cycle life was increased, in some cases dramatically. With gel electrolyte, shedding of active material from the plates was reduced. More importantly, real gas recombination was used to make batteries that were not "watered" and could be called maintenance-free. The one-way valves were set at 2 psi, and this was high enough to have full recombination take place. At the end of charge when oxygen was evolved from overcharge on the positive plate it traveled through the shrink cracks in the gel directly to the negative plate made from high surface area pure lead and "burned" up as fast as it was made. This oxygen gas and the hydrogen adsorbed on the surface of the sponge lead metal negative plate combined to make water that was retained in the cell. 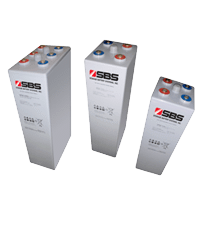 If you have questions regarding which of these batteries will best serve your application, please contact our Sales/Technical Support department.